If lighting is the jewelry in the room, the crown molding is like a proper hem — no stitches showing. Crown molding covers the seam between wall and ceiling and adds weight and architecture to the room. And by drawing the eye upward, crown molding can create the framework for painting the ceiling something other than white. But done improperly, crown molding will lead to painting miscues and a hot mess. I ran into just such a situation today on a high-end new construction job. The carpenter had “built up” the molding by using a couple of inches of wall between the crown at the top along the ceiling and another cheaper piece of finish molding along the bottom edge (photo shows how it’s supposed to look). The idea was to make the finished unit (crown + wall + smaller molding — all painted trim color) look like a giant (read: expensive!) piece of crown molding. What happened was that the carpenter did not finish the edges at the doorway leaving wall space exposed. The painter then came along and, not having a finished piece of molding to serve as the starting point, he (or she) drew a LINE on the wall with a pencil and started painting wall color on the other side of it. Oh…my…gosh… and this was high-end construction?? 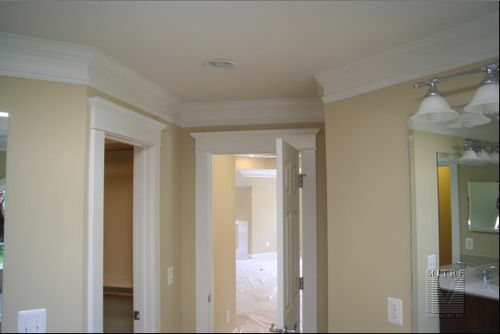 If you are using crown molding, make sure you get an experienced carpenter who has the sense to finish edges. If you’re putting it up yourself, do your research first and know how you’re going to go around corners and finish edges properly. If you are painting a wall, you must have a piece of architectural molding or the wall edge in order to move from one color to another. Never draw a vertical line on the wall to separate two colors unless you’re painting stripes. That’s it! You are currently reading Crown Molding: A Crowning Achievement or a Hot Mess at Your Home & Color Coach.